Predict the plasma protein binding potential of your test compound or xenobiotic using our Plasma Protein Binding assay. In humans, ingested drugs are first absorbed through the gut and then enter the bloodstream, where they interact with blood plasma proteins. 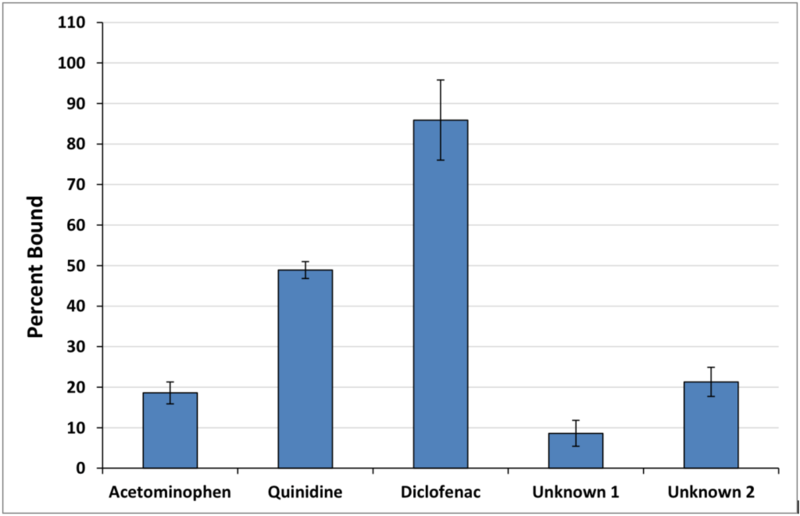 The extent of the plasma protein binding influences the drugs distribution and availability. For example, a compound that binds with high affinity to blood plasma proteins means there will be less free compound available for metabolism. This can reduce the therapeutic effects at a particular dose, and can affect clearance of the compound. IonTox uses solid phase microextraction (SPM) to assess plasma protein binding. The test compound is incubated with human (or rat) blood plasma and a buffered solution (PBS). After incubation, the presence of the test compound is analyzed by LC-MS/MS. % Bound = 100((C1 – C2)\C1) where C1 is the concentration of the test compound in PBS while C2 is the concentration of the test compound in the plasma sample. The graph illustrates the plasma protein binding (% bound) of a control and a two blinded compounds. IONTOX’s Plasma Protein Binding Assay can be combined with our Dynamic Multiple Organ Plate to provide significantly more information on the ADME properties of your test compound(s), The simulated blood system in the Hu-DMOP can be modified to contain plasma proteins and this allows the you to monitor the impact of plasma proteins on distribution.